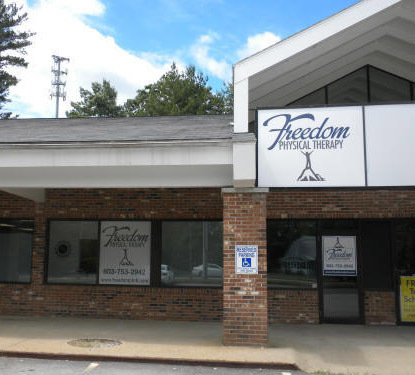 Freedom in Motion Physical Therapy in Concord, NH is a physical therapist owned, independent, outpatient physical therapy practice that is committed to healing through hands-on care and research based treatment. Since 2012, we have provided personalized care to patients of all ages. Our goal is to provide you with the physical therapy services you need so you can quickly and safely return to work, sports, recreational activities and/or daily activities unrestricted and without pain. We take the time to expertly evaluate each patient to gain an understanding of how your problem is affecting your quality of life. We will work with you to develop a comprehensive treatment plan that includes hands-on care, patient education and therapeutic exercise. We believe that patients who understand their condition and therapy process have more successful outcomes than those who do not. Our physical therapy office is independently owned by Darren Gerber, PT, MPT. Our outpatient practice specializes in orthopedics and sports rehabilitation. Darren received his Master’s in Physical Therapy from the University of Texas Health Science Center at San Antonio in 2002. He has been in private practice since 2007, specializing in orthopedics and manual therapy. Darren’s previous work experience includes being the Clinical Administrator and Physical Therapist at a Medicare Certified Comprehensive Outpatient Rehabilitation Facility (CORF) and working in other orthopedic physical therapy practices. Prior to becoming a physical therapist, Darren worked as a radiological technologist. Darren also served his country for 6 years in the US Army. Darren enjoys working with all patients, and has treated patients from 7 years old to 102 years young. He takes a personal approach with every patient, understanding how their injury affects their life and works with them to achieve their highest potential: whether it is returning to work, sports, recreational activities or daily activities. For more information about our physical therapy, sports rehabilitation and orthopedic services, please contact us today at 603-753-2942 or visit our FAQ page. We are proud to serve patients from communities across Merrimack County including Concord, Penacook, Boscawen, Canterbury, Webster, Salisbury, Tilton, Gilmanton, and more.